HOUSTON — Prop B bringing some big changes for the Houston Fire Department, and those changes are sparking rumors - some true, some not. We want to verify one that’s been shared hundreds of times on Facebook. The post is a picture that’s referencing a fire that happened in 2014, where an entire Montrose apartment complex burned to the ground and a man was rescued in the nick of time. 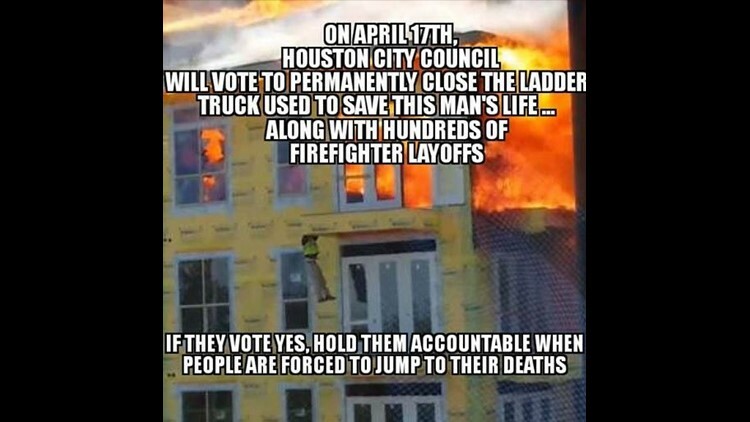 The post is saying the ladder truck that was used to save the man’s life will be closed permanently and there will be hundreds of firefighter layoffs. We went to Sheldra Brigham with Houston Fire for answers. What we can verify is that it’s complicated. The post seems to refer to a proposal made by fire Chief Sam Pena Tuesday for big changes to the department for Prop B, which would restructure equipment and take away three ladder trucks. Brigham says on that day in 2014, Station 18 made the rescue. And under the proposal, Station 18 is losing its tower truck, which is a ladder truck with a bucket, to Station 20, and Station 20’s ladder truck is going away. But the truck that Station 18 used on that day was a reserve. So the claim that the exact truck that rescued the man is closing is false. But if it is approved, Station 18 would lose their tower truck and only keep their engine, which means they would be operating without a ladder. But, Brigham says they are not voting on that next week, and she adds that many stations do not have ladders. When one is needed, they pull from a station that has one. As for the claim of hundreds of layoffs, we can verify that if the proposal is approved on April 17th, that is true - 220 classified firefighters will lose their jobs.